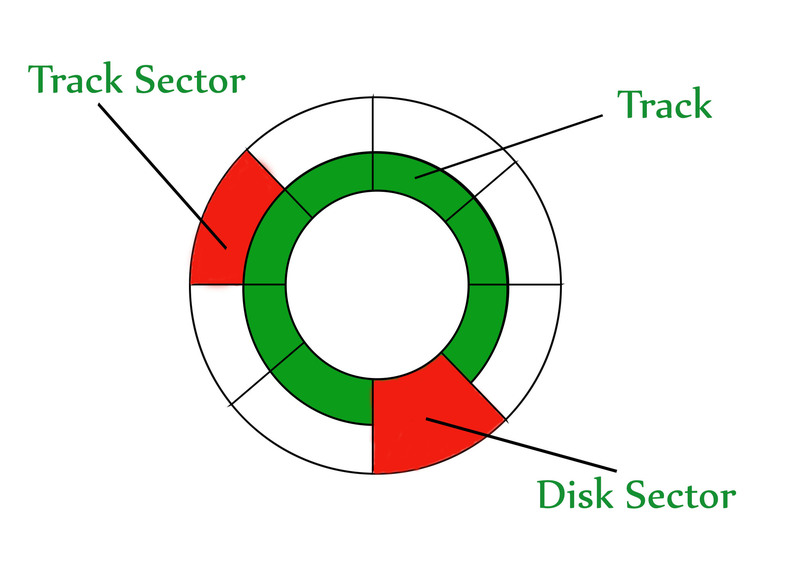 The disk is divided into tracks. Each track is further divided into sectors. The point to be noted here is that outer tracks are bigger in size than the inner tracks but they contain the same number of sectors and have equal storage capacity. This is because the storage density is high in sectors of the inner tracks where as the bits are sparsely arranged in sectors of the outer tracks. Some space of every sector is used for formatting. So, the actual capacity of a sector is less than the given capacity. Seek time – The time taken by the R-W head to reach the desired track from it’s current position. Rotational latency – Time taken by the sector to come under the R-W head. Data transfer time – Time taken to transfer the required amount of data. It depends upon the rotational speed. Controller time – The processing time taken by the controller. Average Access time – seek time + Average Rotational latency + data transfer time + controller time. In questions, if the seek time and controller time is not mentioned, take them to be zero. If the amount of data to be transferred is not given, assume that no data is being transferred. Otherwise, calculate the time taken to transfer the given amount of data. The average of rotational latency is taken when the current position of R-W head is not given. Because, the R-W may be already present at the desired position or it might take a whole rotation to get the desired sector under the R-W head. But, if the current position of the R-W head is given then the rotational latency must be calculated. What is the capacity of the hard disk? The disk is rotating at 3600 RPM, what is the data transfer rate? The disk is rotating at 3600 RPM, what is the average access time? Since, seek time, controller time and the amount of data to be transferred is not given, we consider all the three terms as 0. Rotational latency = (1/60) sec = 16.67 msec. Average Access time = 8.33 msec.